Shop Cordless 2 inch Faux Wood Blinds featuring the look of real wood blinds. 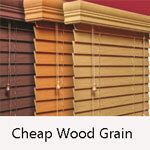 These are the cheapest cordless faux wood blinds offered, yet are made using a steel headrail for durability. Easy to clean and with a designer look, these ready made boxed faux blinds are the perfect choice for home, office, apartments and other facilities where a cheaper price is required. Choose from white faux wood blinds and alabaster faux blinds. Colors Available - Not all sizes available in all colors. Width will be 1/2" Less Than Shown To Allow For Inside Mounting - Click on size for pricing. Faux Blinds provide the look of wood blinds but at a fraction of the cost. Faux Wood Blinds do not crack or warp and are perfect for high humidity areas such as bathrooms, laundry room and kitchens. 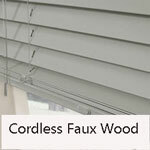 The wider spacing of the Cordless 2" faux wood blinds allow for greater visibility out of your windows and are easily adjusted for light control. These solid vinyl wood blinds are easy to clean. The faux blinds slats will flex and not break, unlike wood blinds which will snap. These Cordless 2 inch faux wood blinds are today's hottest selling window treatments and will add a real sense of class to any homes decor.